Businesses too are inventing new ways with AI to engage customers, make processes easier and drive sales. Natural language generation is a sub-discipline of AI. It converts data into text. Furthermore, it enables computers to communicate ideas with perfect accuracy. As a result, it is used in customer service to generate reports and market summaries. For example, it is offered by companies like Attivio, Automated Insights, Cambridge Semantics, Digital Reasoning, Lucidworks, Narrative Science, SAS, and Yseop. Amazon’s Alexa was a big hit with consumers in 2018. It made it easy for people to search for information on the web. And do things around the home. So you can expect a lot more speech recognition tools in 2019 and beyond. Consequently, Sony, TiVo, and Hisense unveiled TVs that can be controlled by voice. Moreover, home appliance makers such as Delta, Whirlpool, and LG have added Alexa’s voice recognition skills. Eventually, this helps people to control everything in their homes from microwaves to faucets. This is a very important marker in the future artificial intelligence trends. A virtual agent is a computer agent or program capable of interacting with humans. The most common example is chatbots. Uniquely, virtual agents are being used for customer service and support and as smart home managers. Computers also can learn. Machine learning allows computers to learn. This is an important development in the future artificial intelligence trends. Consequently, algorithms, APIs, development and training tools, big data, applications, and other machines have increased. Therefore, Machine Learning platforms are gaining more traction. Furthermore, Machine Learning is used for prediction and classification. Concurrently, companies selling ML platforms are Amazon, Fractal Analytics, Google, H2O.ai, Microsoft, SAS, Skytree and Adext. With AI you can make hardware much friendlier. Furthermore, this is done through new graphic and central processing units and processing devices. These are specifically designed and structured to execute AI-oriented tasks. Eventually, you are about to witness AI-optimized silicon chips. This can be inserted into your portable devices. Moreover, you get access to this technology through Alluviate, Cray, Google, IBM, Intel, and Nvidia. Decision management is already incorporated into a variety of corporate applications. This assists and executes automated decisions for you. This is a breakthrough in the future artificial intelligence trends. In deep learning, you have a unique form of Machine Learning involving artificial neural circuits with various abstraction layers. Eventually, you have the mimicking human brain, processing data and creating patterns for decision making. Furthermore, it is used to recognize patterns and classify applications that are only compatible with large-scale data sets. With biometrics, you can identify, measure and analyze human behavior and physical aspects of the body’s structure and form. Additionally, you can experience more natural interactions between humans and machines. This includes interactions based on touch, image, speech, and body language recognition. This is popular in the market research field. In robotic processes automation, you have scripts and methods that mimic and automate human tasks. This supports your corporate processes. In effect, you can use most of your human talent and move employees into more strategic and creative positions. Eventually, this will aid in the growth of your company. This is breakthrough science in future artificial intelligence trends. In this technology, you have text analytics to understand the structure of sentences. This also involves the meaning and intention of the sentences derived through statistical methods and machine learning. Text Analytics and NLP are mainly used for security systems and fraud detection. You can also use it for a vast array of automated assistants and apps to extract unstructured data. Digital twin is a software construct that bridges the gap between physical systems and the digital world. For example, General Electric (GE), is building an AI workforce to monitor its aircraft engines, locomotives and gas turbines. And also to predict failures with cloud-hosted software models of GE’s machines. In cyber defense, you have a computer network defense mechanism. This focuses on preventing, detecting and providing timely responses to attacks or threats to infrastructure and information. AI and ML are now moving cyberdefense into a new evolutionary phase in response to an increasingly hostile environment. Neural networks are capable of processing sequences of inputs. It can be used in combination with ML techniques to create supervised learning technologies. This will help you uncover suspicious user activity and detect up to 85% of all cyber attacks. In this technology, you have a software that reads the emotions on your human face. This possible using advanced image processing or audio data processing. Emotion recognition helps you capture “micro-expressions,” or subtle body language cues. And also vocal intonation that betrays a person’s feelings. Emotion recognition with AI can enable verbal analyzes and audio inputs to describe your character traits. This including how positive, how excited, angry or moody you are. Marketing automation allows companies to improve engagement and increase efficiency. This accelerates your revenue growth. It uses software to automate customer segmentation, customer data integration, and campaign management, and streamlines repetitive tasks. Marketing automation enhances strategic implementation. 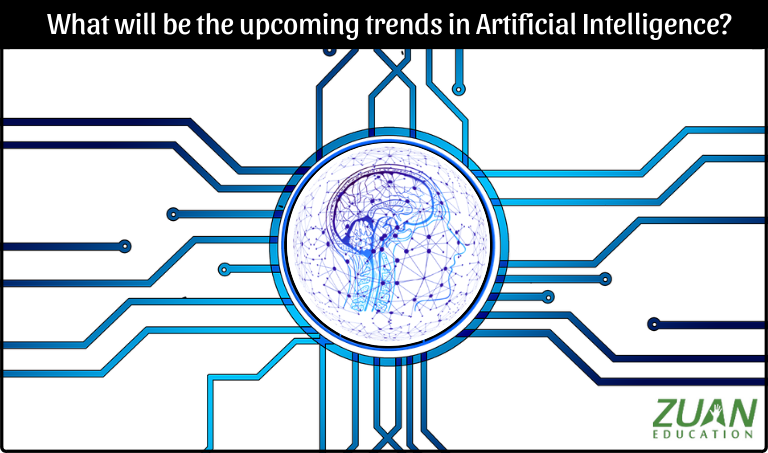 Hence, future artificial intelligence trends will be a great boon to data scientists, innovators, entrepreneurs, and the new generation aspirants. Moreover, AI will make life simpler. You can learn Artificial Intelligence in Chennai from any reputed IT institutions in your area.